Easthorpe Retreat in Easthorpe, near Colchester, Essex sleeps 2 people. Easthorpe Retreat near Colchester is a small picturesque village located 7 miles south west of Colchester on an old Roman road. Nestled in the stunning rural Essex countryside, Easthorpe Retreat is an idyllic haven for couples wanting to escape, relax and unwind. 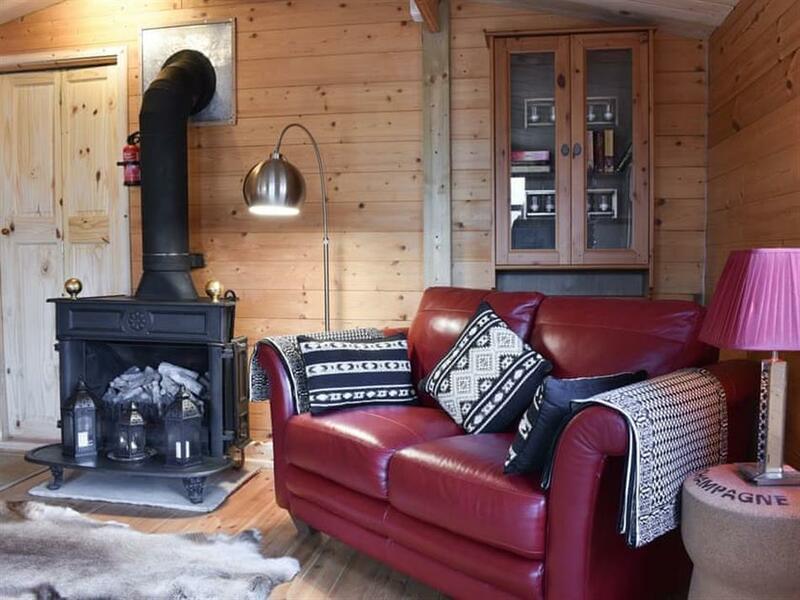 This cosy log cabin is situated within the owners’ grounds but has a secluded setting. 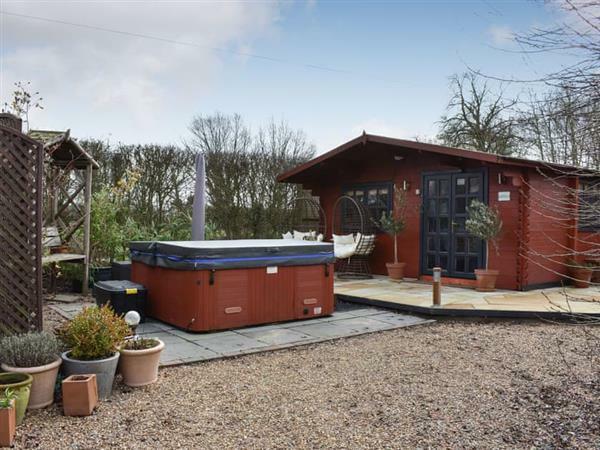 It has an enclosed courtyard garden and exclusive use of a hot tub. The cabin has a sumptuous large bedroom, a small but adequate kitchen with dining and seating areas, and a shower room with complementary toiletries. Easthorpe Reatreat is situated near to Alberton Reservoir, which is the fourth largest artificial body of water in England, and it has a nature reserve with a 900m circular footpath along with three hides to view the wetland wildlife. Colchester, 3 miles, is a large, historic market town and is the oldest recorded Roman town in Britain. Colchester Castle is the largest Norman keep in Europe. It was built in 1076, took 50 years to complete and was a blue print for the Tower of London. Nearby Tiptree, best known for its production of jam for over 150 years, has a museum to show how the art of preserve making has advanced over the years. The delightful tea room serves breakfast, lunch and afternoon tea, and is definitely worth a visit. The historic Layer Marney Tower, 4 miles away, is the tallest Tudor Gatehouse in the UK and here you can climb the 99 steps to the top of the tower, with plenty of rest stops on the way. At the top you will see the breathtaking views of the Blackwater River meandering to Maldon and the estuary, along with the beautiful gardens below. Mersea Island, 12 miles away, is connected to the mainland by a causeway and is home of the famous oysters which have been harvested off the island since Roman times, and are shipped worldwide. There are numerous seafood restaurants serving local catch of the day, including crab, lobster and prawns, found on the Coast Road along with great views of the boating community. There is a beach 12 miles from Easthorpe Retreat near Colchester. With the shop 2 miles, and the pub & restaurant are ½ mile from Easthorpe Retreat. Living area: With 28 Smart TV. Electric central heating, electricitiy, bed linen and towels included. Use of owners’ washing machine. Small enclosed courtyard garden with patio and garden furniture. Hot tub (private). Private parking for 2 cars. No smoking. Holidays at Easthorpe Retreat run from Friday to Friday. For a better idea of where Easthorpe Retreat is, you can see Easthorpe Retreat on the map below. Easthorpe Retreat is in Essex; should you be on the lookout for a special offer, you can find all the special offers in Essex. It's always worth checking to see what is on offer at the moment. Do you want to holiday near Easthorpe Retreat (UK10678), you can see other cottages within 25 miles of Easthorpe Retreat; have a look to find your perfect holiday location.